Fire Safety Rocks: Give-away to Celebrate 100th Live Stream of Sparkles' Safety Spot! Give-away to Celebrate 100th Live Stream of Sparkles' Safety Spot! 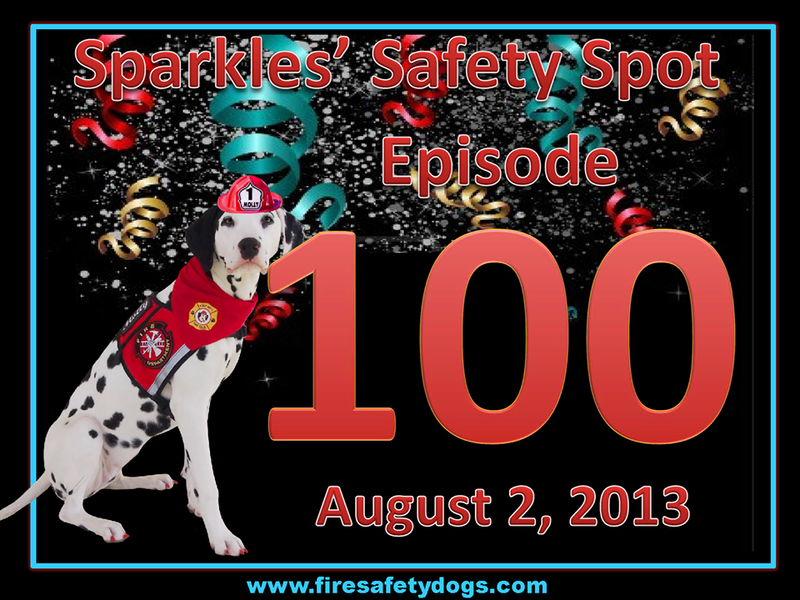 It’s our 100th live stream of Sparkles’ Safety Spot August 2nd! 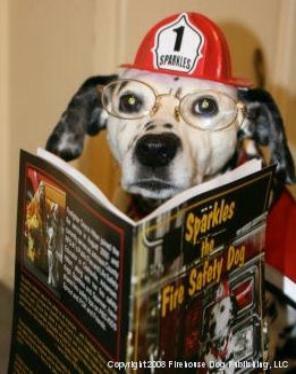 Copy of the first edition of the award winning children’s book, Sparkles the Fire Safety Dog! Each prize package is valued at almost $200!!!! Two winners will be chosen with random.org and notified via email, as well as announced here on our blog. (Open to US residents only). Leave us a comment sending your best wishes for the 100th episode or tell us why you would like to win all this loot! Make sure we have your email. It’s that easy! Deadline to enter is this Friday, 12PM CST. Two winners will be chosen with random.org and notified via email, as well as announced here on our blog. This giveaway is sponsored by the Fire Safety Dogs. Watch the 100th live stream with Molly the Fire Safety Dog, Friday, August 2nd at 9 AM CST. Brought to you by the Keep Kids Fire Safe Foundation and First Alert. You can watch it HERE. Best of luck and stay safe! Until next time, remember: Fire Safety Rocks! Congrats on your Live Streaming, awesome that you can do this, Molly, you are tops! 100th episode! Congratulations to all! I have been a Facebook friend for a little over a year, just prior to Molly joining the family! The work you do is incredible and I can't imagine a better teaching tool for children! Dayna, the work you do with the dogs is unbelievable! I am truly amazed each time Molly shows off a new trick she's learned! Wishing you all continued success with your lifesaving work! Congratulations to all, on your 100th episode! What a special milestone! I have been a Facebook friend, for a little over a year, just prior to Molly joining the family. The work you do terrific. I can't imagine there's anything better to capture the attention of children and teach them such important lessons. Dayna, your dedication to your special dogs and the messages you communicate is inspiring! I am constantly amazed with each new trick Molly shows off! Wishing you continued success! Congratulations to all, on your 100th episode! I can't imagine anything better to capture the attention of children, to teach such important lessons! I am amazed each time Molly shows off a new trick! Dayna, your dedication to the pups and fire safety is truly admirable! Wishing you continued success! I congratulate you on the 100th program with Sparkles the Fire safety dog. I love Dalmations and your program helps so many children understand the dangers of fire and what to do in case of fire. I also love Molly and Tango and seeing the follow in Sparkles paw steps. What you do and how much you put in to helping kids and their families is amazing and having Molly so well trained to help the kids is such a great pay off to all the time required to get her there. Keep up the good work Dayna. I am so glad we have been able to keep Molly and Opal in touch as they grow up together via Molly's Facebook and your work with children. Happy 100th Episode. Congratulations on the 100th episode of Sparkles' Safety Spot. Good luck today Molly, Tango, and Dayna. Can't wait to see you and all the special guests!! Congratulations on your 100th program. The clubhouse looks pawsome. All of you do such a fine job on Fire Safety Education. Keep up the good work Molly, Tango, Siren and Dayna. Love keeping up with you. Congratulations on reaching your 100th episode. THanks for helping us learn about safety. Keep up the good work.